The October 2013 issue of Uncut features a DVD review of Jim Jarmusch concert documentary “Year of the Horse” shot in 1996. They write: “This isn’t older musicians trying to sustain some delusion of youthful potency; this is a bunch of middle-aged men, led by a surly, stomping guitarist in baggy knee-length shorts and a nondescript T-shirt. “Made loud to be played loud. CRANK IT UP!”. 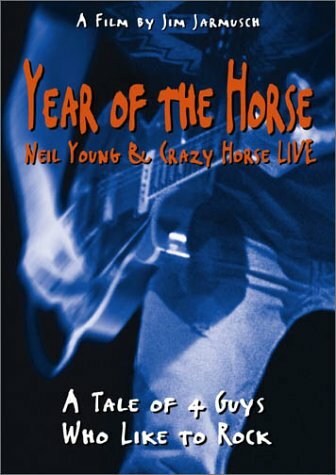 It’s far from the ideal Neil and Crazy Horse setlist, Uncut opines, with only a handful of classics – including a version of “Tonight’s The Night” following a segment about the deaths of Danny Whitten and Bruce Berry – sprinkled parsimoniously through the show. But it barely matters: as Young maintains, “It’s all one song,” an ongoing flow of music hewn into eight-to ten-minute chunks. 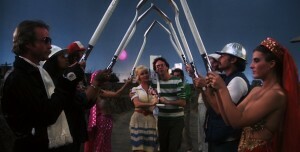 And any technical effects are kept to a minimum, and used subtly, as when stage footage of the band playing “Slips Away” is blended with a tour bus shot of passing sky and landscape.